Often, students may find it difficult to study for quizzes and tests, especially for those that are for things such as the periodic chart or assessments that are heavy on vocabulary. Most students do find flash cards to be helpful, but often it takes a lot of time to complete them. And the students would need to have flash cards to make them on. This is where Zen.do comes in! Zen.do is a new service that allows for a user to create flash cards directly from their notes. The first step is to create a free account so that you can not only create, but save and access your flash cards at a later date. Once an account is created, there are three simple steps to take to create your flash cards. These steps are shown in the photo below, and will open up for you when you go to create a new set of flash cards. 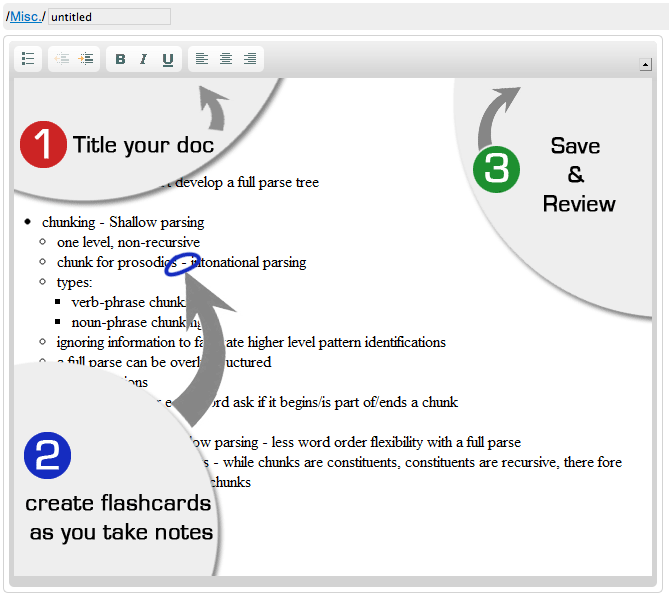 Step 1: Title you document - This is done so that you can keep your flash cards organized. This can be very helpful for studying throughout a chapter. Older flash cards can be studied in preparation for a test or even the final. 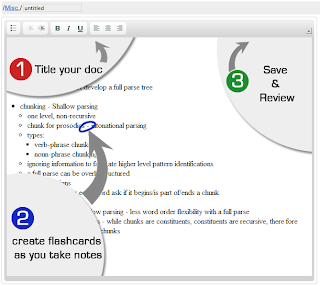 Step 2: Create flash cards as you take notes - This can be very easy to do, especially if teachers provide notes in a digital format. Just copy and paste the notes, delete that which is not needed for studying, and add a hyphen and an answer. Whatever is placed beyond the hyphen will be on the back of the flash card, while whatever is places before the hyphen is on the front. Step 3: Save and review - Once this is done, your flash cards are ready to go. As this is still a new service, it doesn't yet have all of the features one would prefer to really take advantage of using flash cards as a study device, though they are working on them. Among the features in development are the option of being able to share flash cards (great for study buddies or for teachers that want to provide them as extra resources to students who are struggling), the ability to add pictures, and a mobile app for access on the go! For more, visit zen.do and play around to make your own flash cards! UPDATE: It appears that zen.do is now Study Egg. You may have noticed that if you tested the link above. I'm looking forward to checking it out this year, and I'm excited that they have an iPhone app, too!